WASHINGTON, DC - Congressmen Warren Davidson (OH-08) and Darren Soto (FL-09) today introduced the long-awaited Token Taxonomy Act, H.R. 7356, to provide light-touch regulatory certainty for businesses, entrepreneurs, and regulators in the blockchain economy. This bipartisan legislation draws a bright line for businesses and regulators by defining a “digital token” and clarifies that securities laws do not apply to companies that use blockchain once they reach their goal of becoming a functional network. Implementing this fix will stop fraud from spreading and provide the certainty innovation needs to flourish. “This bill clarifies a 1946 court case that the SEC has been using to determine what a security is and effectively makes it clear that the finished product (or oranges as it relates to the Howey Test) is no longer a security. “Providing this much needed certainty frees the SEC to perform its vital and much needed consumer protection duties of enforcement on those who have engaged in securities fraud by making false claims or simply attempting to engage in regulatory arbitrage to circumvent securities law. “This bill provides the certainty American markets need to compete with Singapore, Switzerland, and others who are aggressively growing their blockchain economies. To be certain, there will be other regulatory initiatives at some point, but this legislation is an essential first step to keeping this market alive in the United States. “In the early days of the internet, Congress passed legislation that provided certainty and resisted the temptation to over-regulate the market. Our intent is to achieve a similar win for America’s economy and for American leadership in this innovative space,” said Congressman Warren Davidson. “While this legislation is a great first step, we are looking for feedback. The Federal Trade Commission (FTC) has a history of policing web services, while the Commodities Futures Trading Commission (CFTC) has authority over commodity derivatives. To what extent does the jurisdiction of the FTC apply to digital tokens? Can we address this issue in this legislation or will we need subsequent legislation to effectively regulate this emerging sector?” said Congressman Darren Soto. H.R. 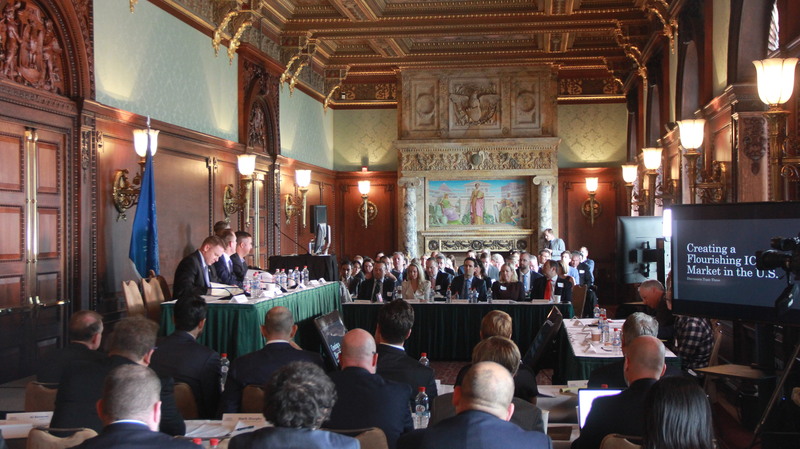 7356, The Token Taxonomy Act, is the product of months long collaboration following a bipartisan roundtable discussion hosted by Congressman Davidson with Members of Congress and nearly 50 stakeholders from Ohio and across the country to gather input on Congress' effort to clarify the "sloppy" regulatory framework in the cryptocurrency space. There, Congressmen Darren Soto (D-FL), Ted Budd (R-NC), and Tom Emmer (R-MN) united in a commitment with other panel participants and stakeholders to provide the legislative certainty innovation needs to flourish in the U.S.
Background: Many entrepreneurs and businesses use distributed ledger or blockchain technology to launch initial coin offerings (ICOs) to raise the capital they need to innovate, grow their businesses, and create more jobs. A patchwork of judicial rulings and conflicting state initiatives have clouded certainty for these companies and is motivating market players to leave the U.S. for the certainty provided elsewhere. Market participants have said that the Securities and Exchange Commission has been regulating by enforcement and market participants have struggled to discern a coherent application of their standards and public statements. SEC Chairman Jay Clayton and SEC Director Bill Hinman have both commented publicly in ways that have either alarmed or encouraged market participants. In December, Congressman Davidson spoke to attendees at the Blockland Solutions Conference in Ohio about his plans to introduce legislation to address this issue. Davidson-Budd-Soto-Emmer Roundtable that was hosted in September.